Apart from the Quran, the most treasured sayings in the Islamic tradition are those of Muhammad himself, which form the Hadith, and none more so than the sayings of God transmitted by Muhammad, known as hadith qudsi ("sacred sayings"). Ibn 'Arabi�s Divine Sayings is one of the most important and influential early collections of hadith qudsi. It comprises 101 sayings, drawn from the oral tradition as well as written collections. 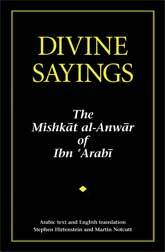 Divine Sayings is a critical edition and translation of the full Arabic text, with notes, compiled from the best early manuscripts. Stephen Hirtenstein is a co-founder of Anqa Publishing, which published his biography of Ibn �Arabi: The Unlimited Mercifier. His numerous other publications include The Seven Days of the Heart, a translation with Pablo Beneito of Ibn �Arabi�s Awrad (prayers for the nights and days of the week). Stephen is editor of the Journal of the Muhyiddin Ibn �Arabi Society. Martin Notcutt came to the UK from South Africa in the 1970s. He was a student at the Beshara School in Scotland, where he was introduced to the works of Ibn �Arabi, and has been a member of the Muhyiddin Ibn �Arabi Society since it was founded in 1977.